Pens Fatales: The Pens are Back! Gigi here. It's true! We're back! 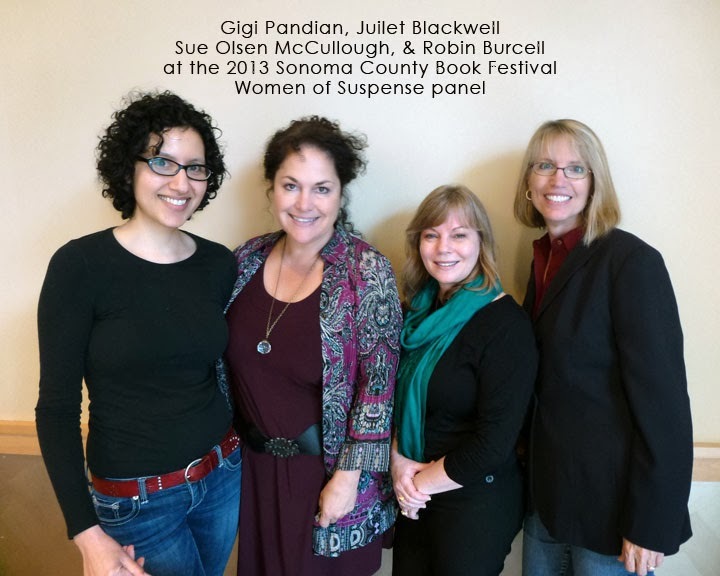 The Pens Fatales began in 2009, a group of eight women beginning our writing careers. Each fortnight we would select a new topic to discuss, and for three years we had a great time blogging and getting to know many of our readers. By 2012, we were all busy with more writing projects than we ever imagined. We felt like we'd had a good run, so we decided to abandon daily blogging. Our last regularly scheduled post was on the topic of "friendship" in April 2012.
at the Sonoma County Book Festival yesterday. But... we missed the blog! So we got together and brought it back. Our favorite parts of the blog will still be here, but format is a bit different. Rather than different topics, we'll be blogging about all things writing-related. We've learned so much about writing and publishing since we came together in 2009 -- one of the most important things being that it's important to have a tribe of like-minded writers. This is our tribe. Not everyone had time to fit blogging into their schedules, so while we're all still friends offline, here on the blog you'll notice a slightly new line-up. We'll miss our absent founding members, but we're thrilled to be back! There are 9 of us and we'll each post one blog post per month, approximately every three days. My day is the 22nd, so here I am to welcome everyone back. On my end it's been an exciting year, and especially an exciting summer. I recently signed my second three-book deal within four months. Yes, it's pretty surreal. It took a long time to get here, but thanks to the encouragement and wisdom of the Pens, I'm now writing both the Jaya Jones Treasure Hunt Mystery Series for Henery Press and a new forthcoming series for Midnight Ink. Rather than turn this post into a novel itself, I'll share further details later. 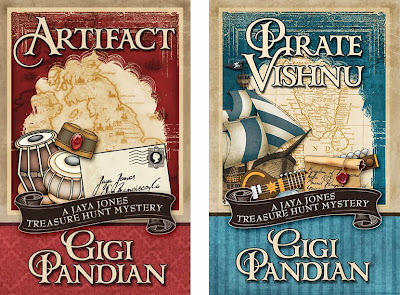 In the meantime, I can't resist sharing my gorgeous book covers from Henery Press. Artifact was re-issued in August of this year, and Pirate Vishnu (#2) comes out in February 2014. All our links to find us elsewhere on social media are in the "Check Out the Authors" section at right. Thanks to everyone who suggested we continue this blog. You were right. We're glad to be back. Thanks for folding me in! Can't wait to read more fabulous Pen posts!!!!! This is great! I'm so glad the Pens Fatales are back! Yay! I've missed your posts so much and I am thrilled you're starting again.